Purchase eBook and read excerpt here. 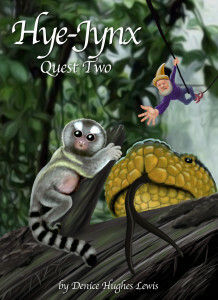 Take another wild adventure in Magic-Time with Neil, his sister Sandi and their tiny wizard friends, Hye and Jynx. This quest takes the travelers to the dangerous Amazon Rainforest, home to jaguar, anaconda, caiman and eagle. They need to find a seedpod from the Kapok tree. Jynx loses his wand and becomes a monkey. Will the team succeed in their quest, find the wand and be able to return home? Another wild adventure is the last thing that Neil wants. In their first quest to the Grand Canyon with two tiny wizards, he and his sister Sandi barely survived. Now they have to go to the Amazon Rainforest to retrieve a second natural wonder. Traveling in Magic-Time has its own rules – all who start together, must finish together. Neil thinks he is prepared for the second quest. All they have to do is to get in, find the seedpod from a Kapok tree and get out. Fifteen minutes in Earth time, tops. How hard can it be? Harder than Neil thinks. Miscalculating, the adventurers land in the dark on top of the rainforest canopy. A storm blows the tiny wizards away. Neil is horrified to think that they are on their own – without magic, or a flashlight or a weapon of defense against the wild animals that live in the trees.